A team of five Bhutanese bagged two gold medals and one silver at the 2nd Historical Archery World Championship held in Hungary recently. The Historical Archery World Championship is a traditional archery competition supported by the International Archery Association. The competition is held after every two years. More than 300 archers from 21 countries flaunted their unique and antique bow and arrow at the competition. With traditional Bhutanese bow and arrow, the Bhutanese team tried their luck in every category of the contest, but it was only in the long-distance target category where the team thrived. 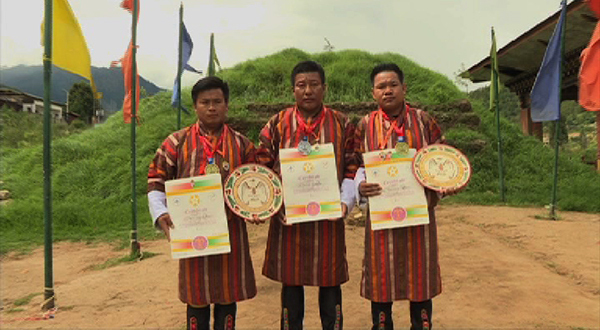 Yonten Phuntsho and Damcho Wangdi won a gold medal each, while Karma Karma bagged the silver medal in the same category. “Yonten and I trained for around three weeks at the Semtokha archery range. I feel it is because of that intensive training we managed to win the gold medals this time,” Damcho Wangdi said. The Bhutan Indigenous Games and Sports Association said the win is an important achievement not only for the country but also the traditional archery sport. Bhutan also participated in the first edition of the Historical Archery World Championship in 2016. Meanwhile, the Bhutan Indigenous Games and Sports Association is already working towards hosting a similar international competition in the country next year.